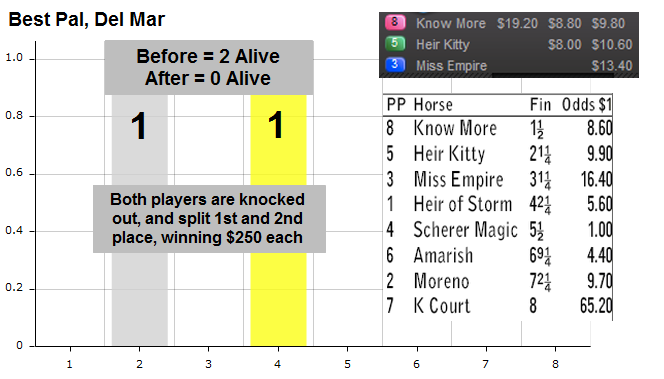 August 4-5 weekend’s $500 Graded Stakes Survivor game was a great example of how you can triumph in Survivor games. It’s also a great example of just how picking a horse to show sounds easy – but Survivor can be brutally tough as well. 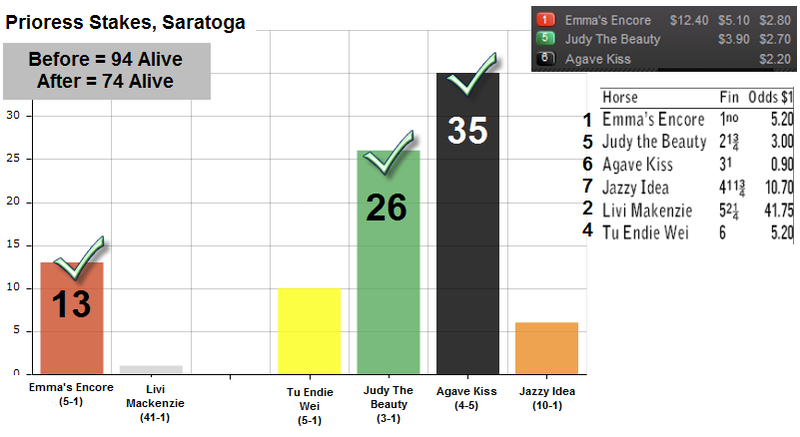 In this race, Agave Kiss was the 4-5 favorite in a field of six. She looked shaky in the stretch and held on for third. Judy The Beauty ran second as the 3-1 second choice. Together, those two got 61 entries through and another 13 had the winner Emma’s Encore. But note that even in this chalky leg, 20 players were out of the money. Down to 74. Here, fan favorite Hansen was an overwhelming 3-5 favorite, and he took 52 of the 74 Survivor selections. While he seemed like a “free square” and an easy leg, it’s important to note that most everyone put their eggs in this basket. So, with a misstep by Hansen, this game would be nearly over. Sure enough, Hansen ran fourth, and this Survivor game when from 74 to 16 entries in two minutes. 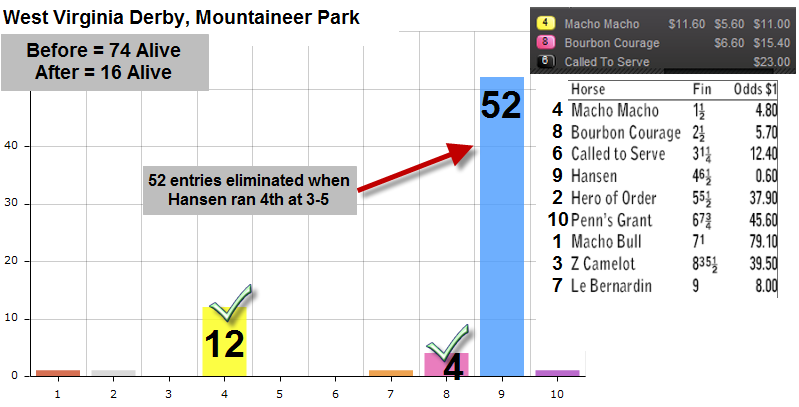 Interestingly, Macho Macho and Bourbon Courage, the 1-2 finishers, were the clear 2nd and 3rd choices in the race. Those that hedged with the 4 and 8 were rewarded. At this point, there were 16 entries left and they could taste victory. But things weren’t getting any easier. The Whitney knocked out half of the field as Hymn Book ran fourth, and others spread with the 2 and 3. Here the final 8 performed strongly as only two were knocked out. 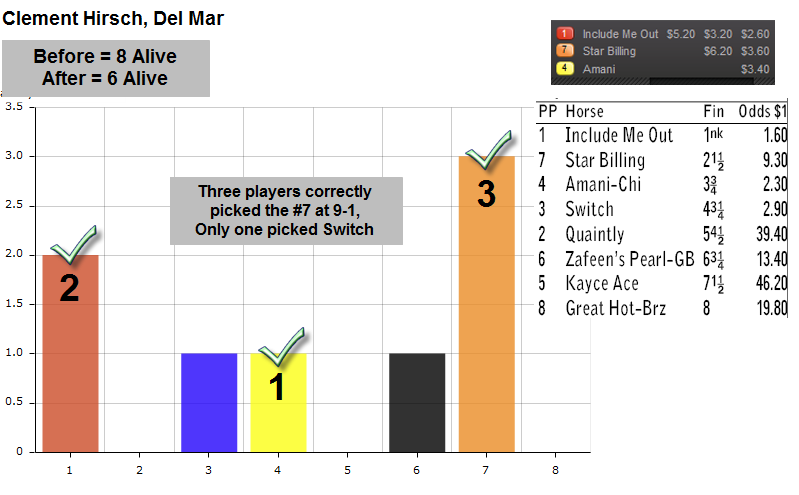 Suprisingly, the most picked horse was the #7 horse Star Billing, who finished second at 9-1. A day later and down to 6 entries, this was the race that dealt the knockout blow. 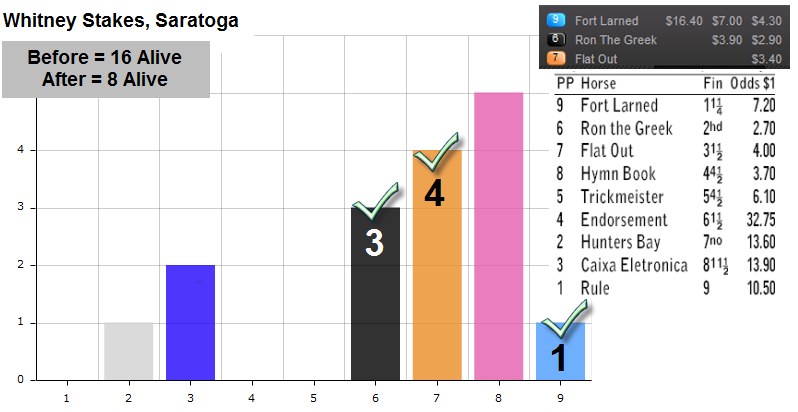 Shackleford running last at 6-5 took down 2 entries, and #4 Rothko and #7 Jersey Town took down two more. The final two picked Emcee and were now in the money. The only question would be whether they would be splitting the $500 or whether someone would take home the first place prize. 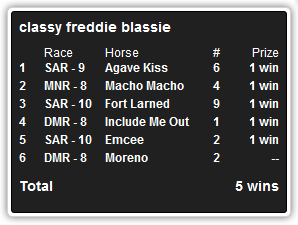 BromosDad and ClassyFreddieBassie were the two remaining entries, but neither could come up with the 1-2-3 finishers of the Best Pal, so they ended up splitting the $500 and taking home $250 each. Not bad for a $4 entry! So How Did The Winners Do It? BromosDad successfully employed a 3-entry strategy. He singled Judy The Beauty in the first leg, but then spread all three out in the West Virginia Derby. 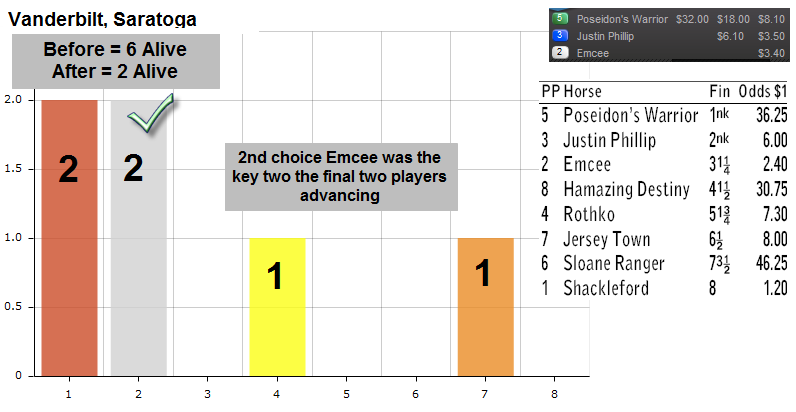 That proved fruitful, because even though he lost entry #1 with Hansen, he now held two of the remaining 16 entries. He then nailed Flat Out in the Whitney and Star Billing in the Hirsch on both entries, giving him 2 of the remaining 6 entries in the Vanderbilt on Sunday. He spread those picks out, and by using both #2 Emcee and #7 Jersey Town, he doubled his chances of getting through this tricky leg, which ultimately proved to be a wise decision. Classy Freddie Blassie (great name) powered through Survivor in an entirely different means. He had one entry and he was on fire. After getting through the first leg with Agave Kiss, he reeled off three winners in a row: Macho Macho (9-2), Fort Larned (7-1) and Include Me Out (8-5). That put him in the spot to pick Emcee in the Vanderbilt and finish in the final two. Congrats to both of our winners – BromosDad (William Ortega) and Classy Freddie Blassie (Richard Everson)! No strategies, those two just were lucky that day, how many other survivor games did they win. It’s anyones guess, you just have to play your hunches and hope the favorites come thru in the early stages. Hello! I’ve been reading your web site for some time now and finally got the courage to go ahead and give you a shout out from Kingwood Texas! Just wanted to mention keep up the great job! Hello, you used to write excellent, but the last several posts have been kinda boring I miss your great writings. Past several posts are just a bit out of track! come on! Greetings I am so thrilled I found your site, I really found you by mistake, while I was searching on Aol for something else, Anyhow I am here now and would just like to say thanks for a fantastic post and a all round interesting blog (I also love the theme/design), I dont have time to read through it all at the minute but I have saved it and also added in your RSS feeds, so when I have time I will be back to read a lot more, Please do keep up the superb job. Hello there! This is my first comment here so I just wanted to give a quick shout out and say I genuinely enjoy reading your blog posts. Can you suggest any other blogs/websites/forums that deal with the same subjects? Thanks for your time! Thanks for your marvelous posting! I really enjoyed reading it, you might be a great author.I will make sure to bookmark your blog and definitely will come back someday. I want to encourage one to continue your great job, have a nice day! having my breakfast coming again tto read further news. blogging. Υߋu ɦave touched ѕome ցood things Һere. Any wway ƙeep սρ wrinting. I am really loving the theme/design of your web site. Do you ever run into any browser compatibility problems? A couple of my blog audience have complained about my website not operating correctly in Explorer but looks great in Firefox. Do you have any recommendations to help fix this issue? Do you mind if I quote a couple of your posts as long as I provide credit and sources back to your weblog? My website is in the very same area of interest as yours and my users would really benefit from some of the information you present here. Please let me know if this ok with you. Many thanks! It’s a shame you don’t have a donate button! I’d without a doubt donate to this superb blog! I suppose for now i’ll settle for bookmarking and adding your RSS feed to my Google account. I look forward to brand new updates and will share this site with my Facebook group. Chat soon! Hello I am so delighted I found your webpage, I really found you by error, while I was searching on Google for something else, Nonetheless I am here now and would just like to say thank you for a marvelous post and a all round exciting blog (I also love the theme/design), I dont have time to look over it all at the minute but I have book-marked it and also included your RSS feeds, so when I have time I will be back to read more, Please do keep up the great job. This will be a excellent web page, will you be interested in doing an interview about just how you created it? If so e-mail me! Hi there I am so thrilled I found your site, I really found you by accident, while I was looking on Google for something else, Anyways I am here now and would just like to say thanks for a marvelous post and a all round enjoyable blog (I also love the theme/design), I dont have time to read through it all at the minute but I have bookmarked it and also added your RSS feeds, so when I have time I will be back to read a lot more, Please do keep up the excellent work. I love your wp design, wherever would you download it through? Greetings from Los angeles! I’m bored to tears at work so I decided to check out your website on my iphone during lunch break. I really like the knowledge you provide here and can’t wait to take a look when I get home. I’m amazed at how fast your blog loaded on my phone .. I’m not even using WIFI, just 3G .. Anyhow, wonderful site! I do enjoy the manner in which you have framed this challenge plus it does indeed provide me personally some fodder for thought. Nonetheless, coming from what precisely I have observed, I simply just hope as other opinions pile on that folks remain on point and don’t start upon a soap box regarding the news du jour. All the same, thank you for this exceptional point and while I can not agree with this in totality, I value your standpoint. This is a great blog, would you be involved in doing an interview about just how you developed it? If so e-mail me! I’m really enjoying the theme/design of your site. Do you ever run into any browser compatibility issues? A couple of my blog audience have complained about my website not working correctly in Explorer but looks great in Safari. Do you have any solutions to help fix this issue? Fantastic site you have here but I was curious about if you knew of any message boards that cover the same topics talked about in this article? I’d really like to be a part of group where I can get responses from other knowledgeable individuals that share the same interest. If you have any recommendations, please let me know. Thanks a lot! best place to start is by contacting the local Bar association in your area. Then it is his responsibility to file the application. HeconsistentlywritesonassortedcapacitylikeBarter&Carblowabrasionlawyers,Braininjury,Birthinjury,Autoabrasionandaboundingaddedsuchtopics. Greetings from Carolina! I’m bored to tears at work so I decided to browse your blog on my iphone during lunch break. I really like the info you present here and can’t wait to take a look when I get home. I’m amazed at how fast your blog loaded on my cell phone .. I’m not even using WIFI, just 3G .. Anyways, wonderful blog! Howdy I am so happy I found your website, I really found you by accident, while I was searching on Askjeeve for something else, Nonetheless I am here now and would just like to say many thanks for a fantastic post and a all round enjoyable blog (I also love the theme/design), I dont have time to look over it all at the moment but I have bookmarked it and also added in your RSS feeds, so when I have time I will be back to read a great deal more, Please do keep up the fantastic job. Hi I am so excited I found your website, I really found you by accident, while I was looking on Bing for something else, Nonetheless I am here now and would just like to say many thanks for a tremendous post and a all round enjoyable blog (I also love the theme/design), I dont have time to browse it all at the moment but I have bookmarked it and also included your RSS feeds, so when I have time I will be back to read a lot more, Please do keep up the great job. I’m curious to find out what blog platform you happen to be using? I’m experiencing some small security issues with my latest blog and I’d like to find something more safeguarded. Do you have any solutions? Audio began playing any time I opened up this webpage, so irritating! I’m really enjoying the theme/design of your website. Do you ever run into any internet browser compatibility issues? A number of my blog readers have complained about my website not working correctly in Explorer but looks great in Safari. Do you have any ideas to help fix this issue? This will be a excellent website, might you be involved in doing an interview regarding how you created it? If so e-mail me! Howdy I am so glad I found your blog page, I really found you by accident, while I was searching on Yahoo for something else, Anyways I am here now and would just like to say kudos for a incredible post and a all round thrilling blog (I also love the theme/design), I dont have time to read through it all at the moment but I have saved it and also added in your RSS feeds, so when I have time I will be back to read a great deal more, Please do keep up the awesome job. Hi there! I understand this is sort of off-topic however I needed to ask. Does managing a well-established website like yours require a lot of work? I’m brand new to operating a blog however I do write in my diary everyday. I’d like to start a blog so I can easily share my personal experience and views online. Please let me know if you have any recommendations or tips for brand new aspiring blog owners. Appreciate it! off questions for you if you don’t mind. loolk like they are written by bran dead people? 😛 And, if youu are writing on additional social sites, I woulpd like to follow you. My partner and I absolutely love your blog and find almost all of your post’s to be precisely what I’m looking for. Does one offer guest writers to write content available for you? I wouldn’t mind creating a post or elaborating on a few of the subjects you write about here. Again, awesome web log! Hi I am so grateful I found your webpage, I really found you by error, while I was researching on Aol for something else, Anyhow I am here now and would just like to say kudos for a remarkable post and a all round entertaining blog (I also love the theme/design), I dont have time to look over it all at the moment but I have bookmarked it and also added in your RSS feeds, so when I have time I will be back to read much more, Please do keep up the fantastic work. Wonderful blog! Do you have any suggestions for aspiring writers? I’m planning to start my own site soon but I’m a little lost on everything. Would you recommend starting with a free platform like WordPress or go for a paid option? There are so many choices out there that I’m totally confused .. Any ideas? Kudos! with thhe layout on your weblog. Is this a paid theme or diid youu modify it yourself? My developer is trying to persuade me to move to .net from PHP. I have always disliked the idea because of the costs. But he’s tryiong none the less. I’ve been using Movable-type on numerous websites for about a year and am anxious about switching to another platform. I have heard good things about blogengine.net. Is there a way I can transfer all my wordpress posts into it? Any help would be greatly appreciated! with a strong magnifying lens. Well, healthy, thriving, well-fed microorganisms equals a healthy, thriving garden. Hi! Quick question that’s completely off topic. Do you know how to make your site mobile friendly? My site looks weird when browsing from my apple iphone. I’m trying to find a template or plugin that might be able to resolve this issue. If you have any suggestions, please share. Cheers! apply caulking or weather stripping to seal them off. So they could attack the wooden structures of the building and cause extensive damage. not to mention, severe pain, for any tattoo removal.